Australia Day on the Gold Coast is all about the nations love affair with the beach. Aussies love the beach and the Gold Coast has some of the best beaches in Australia. Some would say the world! So this National Day on the 26th January get together with friends and family and you might like to head to one of the Gold Coast beaches. There are many venues of pubs, restaurants and cafes where fine Aussie tucker will be available in the vicinity. And why not get an Aussie Flag patterned towel and put on your brightest things! Good on ya cobber! You can't help yourself on getting out and about on the Gold Coast. It's a celebration and friendly place. 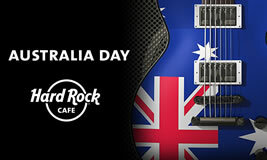 We hope you like these ideas for a top Australia Day. It's pretty simple on the Gold Coast ... get to the beach or one of the venues along the fabulous Gold Coast foreshore. Enjoy your Gold Coast Australia Day. Love and the Gold Coast go hand in hand. Romance is in the air! February 14th is Valentine's Day on the Gold Coast. This special day is the next Big Day for the Gold Coast Summer. Restaurants and venues will be filled with lovers.